Although the general outward appearance is virtually the same as the Precision M6400s and M6500s, there are some changes that I think are a vast improvement. On the older models, with the exception of the power receptacle, all connectors are along the sides of laptop. 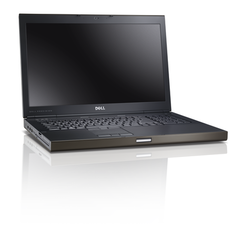 On the M6600 eSATA, HDMI, VGA, and Ethernet join the power port on the back of the laptop. USB 2.0, Firewire, and audio are still on the left while the M6600 has two USB 3.0 ports and Display Port on the right. This is a big improvement. Plugging everything into the sides, especially Ethernet, makes a mess of the desktop. The UltraSharp 1920x1080 display is bright, crisp, and beautiful. The one I have has a little backlight leakage on the sides that's detectable with a black background at full brightness. Some display tweaking may improve this a little but I doubt it will go away completely. This is a big, powerful machine, battery life is not going to be great. I ran a mixed use test (HD video playback, browsing, a little CAD, etc.) and it took just over 3 hours to get down to 11% before I plugged it back in. I don't think that's too bad. Portability and battery life are not really this things bag. I assume a higher percentage of CAD usage or anything that engages the discrete graphics is going to shorten the battery life. The M6600 is basically an updated M6500. A fan of the previous models will only find more to love here. On the other hand... these things are huge and they have a huge power brick. More and more I'm looking for the smallest computer to take with me, but if you need power and discrete, CAD optimized, graphics like AMD FirePro or NVidia Quadro, this should be near the top of the list. I've included the Windows 7 performance index numbers from my system below, for what they're worth.